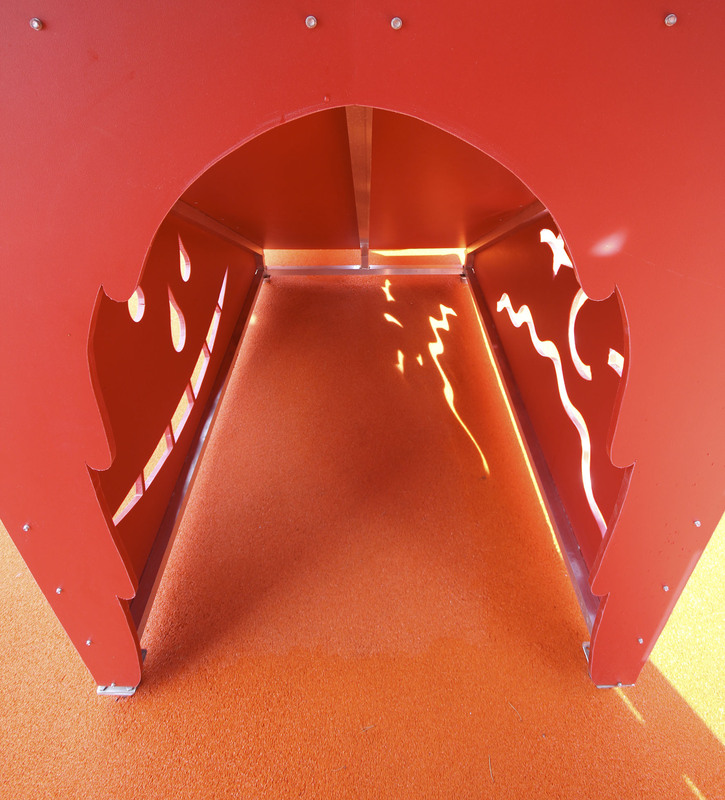 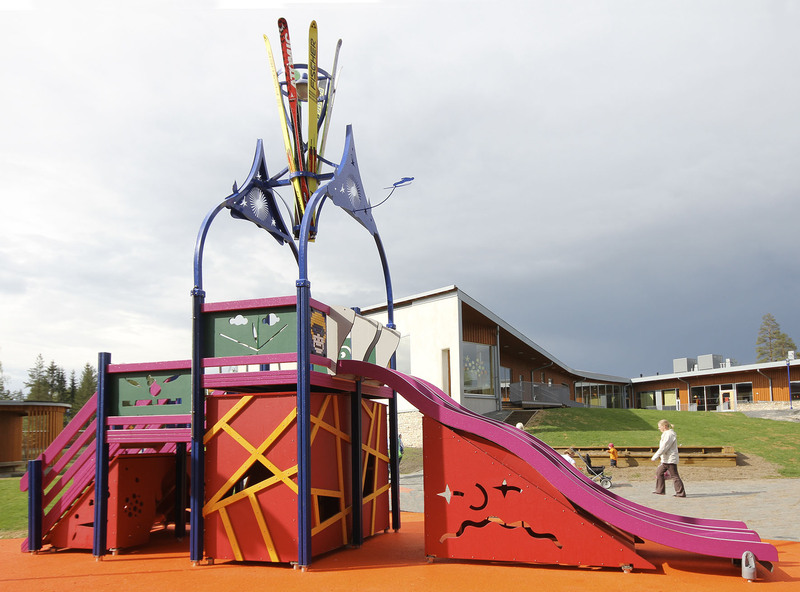 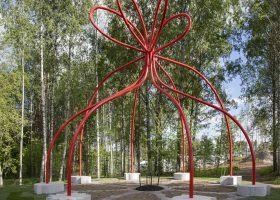 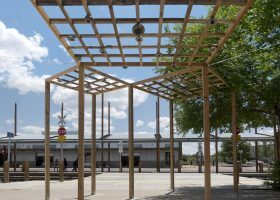 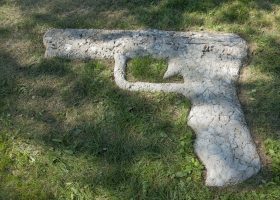 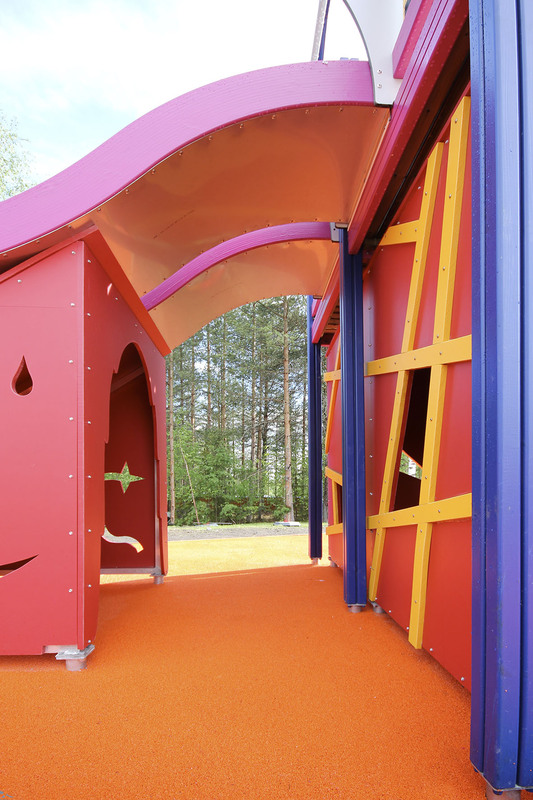 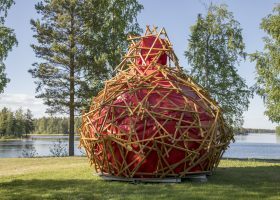 Andersson was commissioned by Kuopio Art Museum to make a sculptural work, which also could be used as a playground for the children in the Lehtoneimi day care center in the heart of the new built ”Archipelago City” suburb of Kuopio. For Andersson Kuopio has always been related to ski jumping because of the big Puijo ski jump tower, which is an important part of the Kuopio skyline. 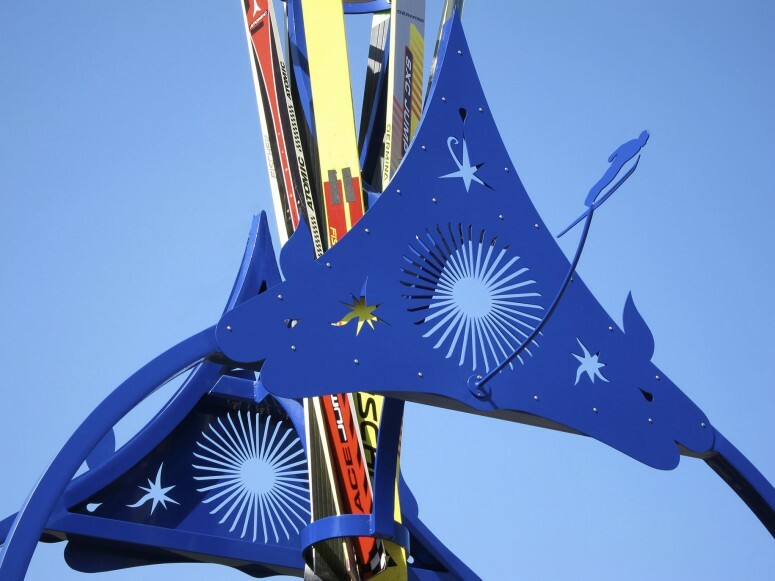 Andersson decided to create an installation, where real ski jumpers’ skis would be combined with the interesting and beautiful wooden structures which kept up the old wooden ski jumping towers, now out of use and slowly decaying. 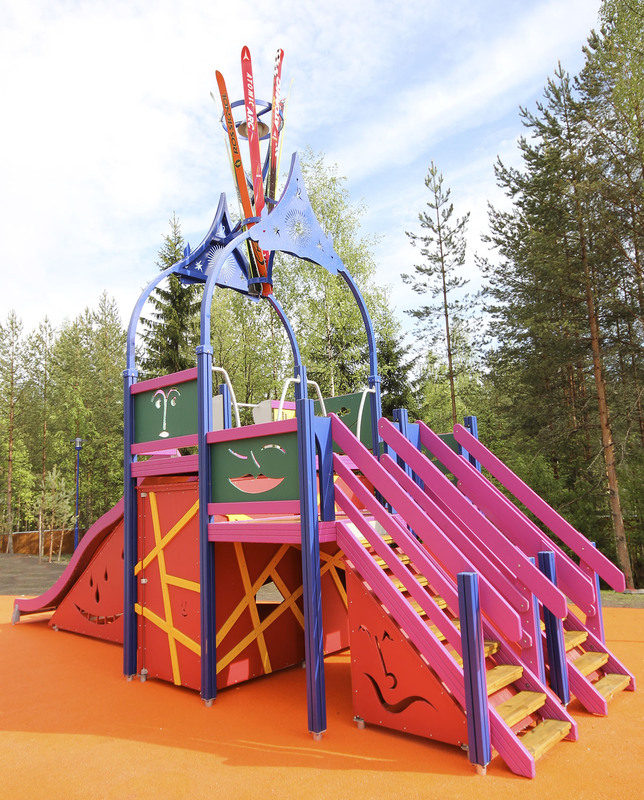 Through many discussions with the city officials and the personnel from the day care center the idea evolved into a structure which has two slides side by side reminding of the ski jumping towers. 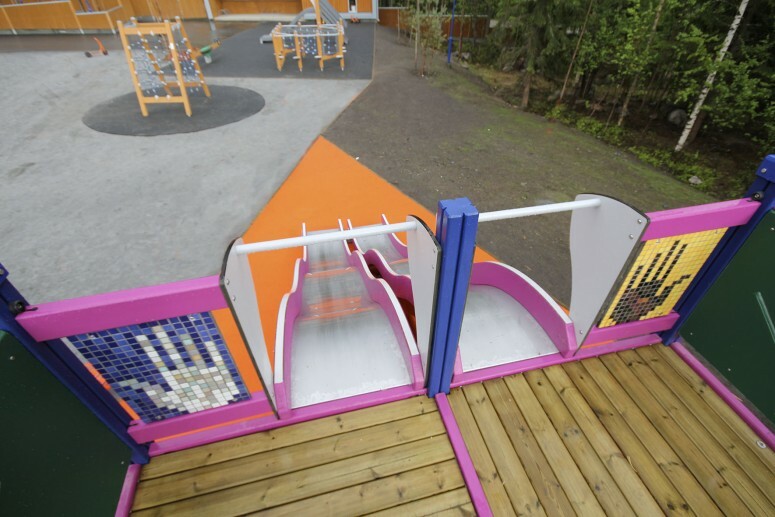 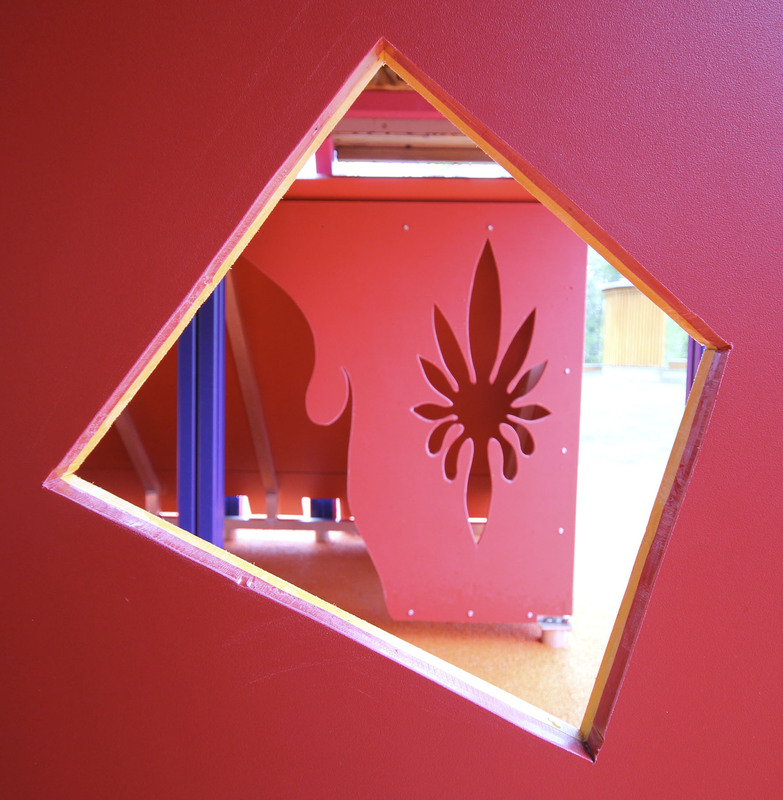 Underneath the slides there are three cabins, which the children can use for playing. 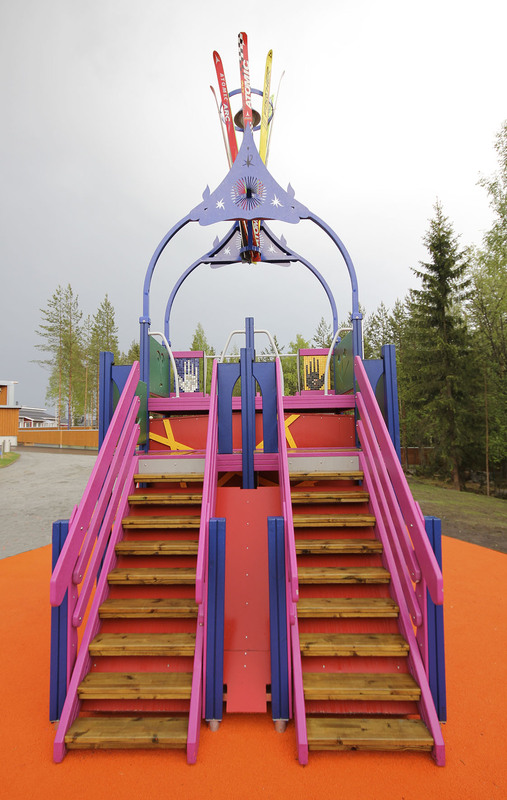 To create a wooden network for children to climb on – like the ones in the old wooden ski jump towers – would have been too difficult because of tight security norms for children playgrounds, but the yellow lines on the central cabin are a trace of this idea. 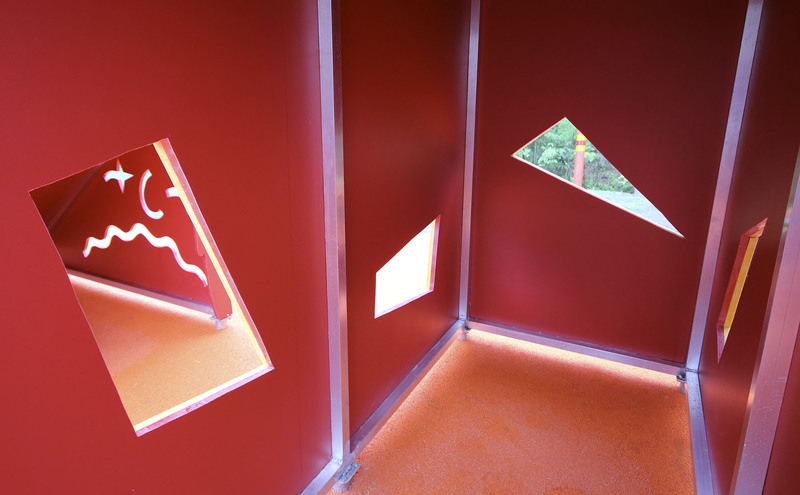 Andersson’s interest in what he calls Iconic space, can be seen in the shapes of the window openings in the cabins. 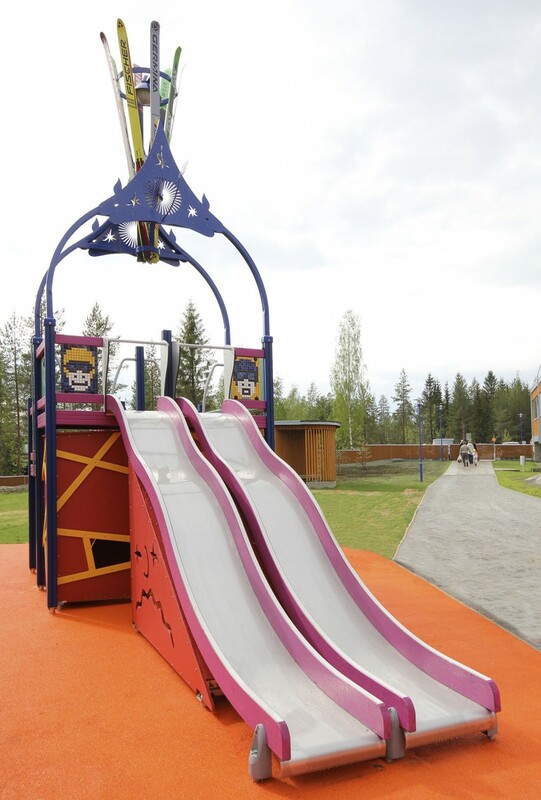 They are stylized face expressions of the jumpers after the jumps; some happy some sad! Looking at the surrounding through these windows, you will find many interesting three dimensional pictures when you move in and around the structure. 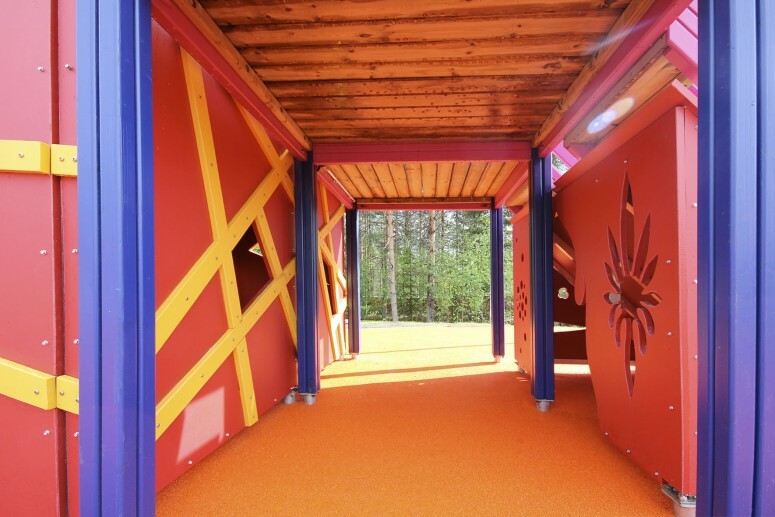 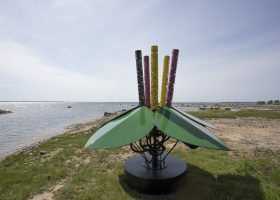 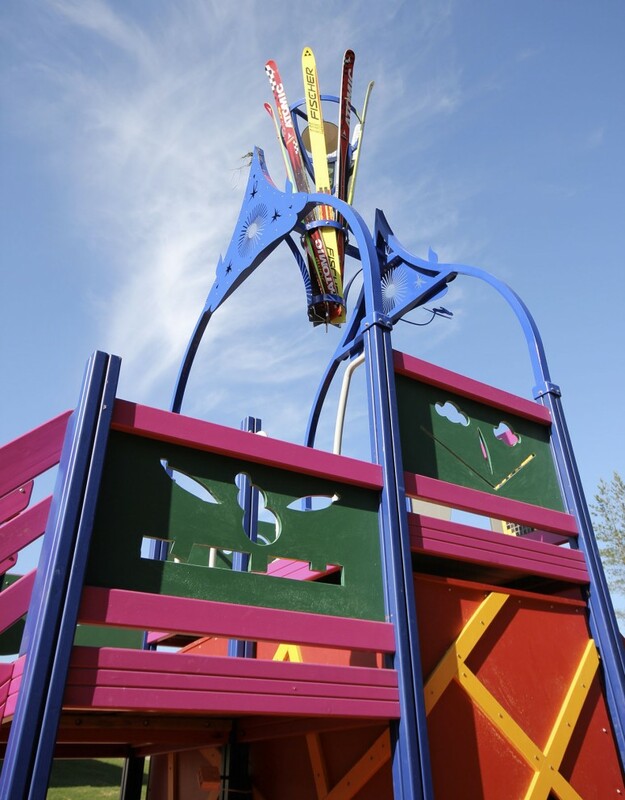 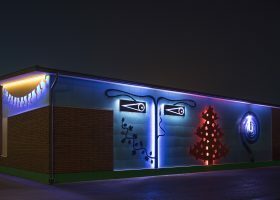 To give the children an experience of heightened sublimity on the top of the installation, Andersson created an ornate metal structure crowned by an arrangement of ski jumpers’ skis holding a light fixture. 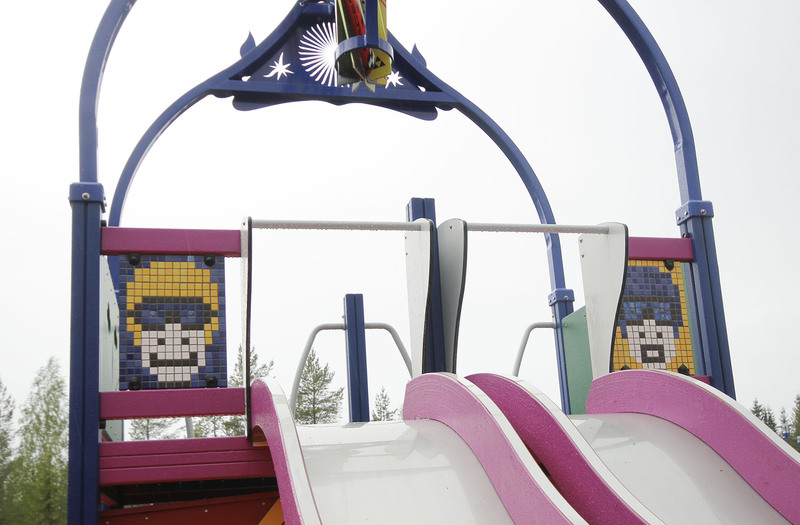 Andersson also made two ski jumpers’ heads in mosaic facing the children from the front.